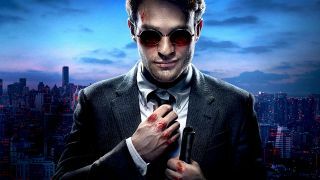 Daredevil, the man without fear, is headed back to Netflix for a second season in March. To celebrate, YouTuber UpIsNotJump has recreated Daredevil's season two trailer in Fallout 4, which you can view above. I think it's a pretty stellar recreation, and he's done a great job making some convincing replicas of Matt Murdock and Frank Castle, The Punisher. For comparison, here's the trailer for the actual show. Via email, he told me it took him roughly 30 hours to put the trailer together, and he's considerately included a short blooper reel at the end. There you'll see him repeatedly attempting to get blood splatter to work properly, as well wrestling with some misbehaving physics objects. If you read the video description you'll find a list of mods he used for the trailer, including those for costumes, lighting, and accessories. Speaking of Fallout 4 mods, you can find our own list of favorites right here.